Our theater critic picks his five favorites of the summer-fall 2019 season, so far. With the fall theater season in full swing, allow us to take a moment to pause, reflect and rank the top five new (and still running) shows we’ve seen on and off Broadway since the summer months. When it comes to theatrical flair, Jez Butterworth’s epic and explosive drama (which is directed by Sam Mendes and comes to Broadway following an acclaimed London premiere) has pretty much got it all, including a three-hour-plus running time, a 30-plus member cast, sexual heat, mystery, divisive politics, alcohol, Irish tradition, dark comedy and violent tragedy. In Northern Ireland circa 1981, the body of a man who disappeared a decade earlier is found in a bog, attracting the attention of the Irish Republican Army and triggering danger for a farmer and his large family. Read the review. “The Ferryman” plays an open run at the Bernard B. Jacobs Theatre, 242 W. 45th St., theferrymanbroadway.com. Although it is built around songs by Bob Dylan, “Girl from the North Country” (which has direction and book by Irish playwright Conor McPherson) is not so much a jukebox musical as it is a bleak, enigmatic and haunting Depression-era drama about flawed individuals in desperate circumstances. McPherson makes no attempt to have any of Dylan’s introspective, poetic songs (arranged in a period country-folk style) directly flow to dialogue. Instead, they function as a kind of live soundtrack, commenting on scenes and heightening moods and emotions. Whether you call it a musical or a drama or something else, the show makes for remarkable theater. Read the review. “Girl from the North Country” runs through Dec. 23 at the Public Theater, 425 Lafayette St., publictheater.org. The “bright golden haze on the meadow” is replaced by dark storm clouds in Daniel Fish’s experimental, stripped-down and rough-edged revamp of Rodgers & Hammerstein’s 1943 musical theater classic. There is no ensemble, no pausing for scene changes (creating a streamlined flow), little dancing and just a seven-piece bluegrass band to play the re-orchestrated score. An ominous tone pervades each scene. For the most part, this proves to be an intriguing and compelling interpretation that allows viewers to experience “Oklahoma!” with fresh eyes and ears. Read the review. “Oklahoma!” runs through Nov. 11 at St. Ann’s Warehouse, 45 Water St., DUMBO. Stannswarehouse.org. Two years since “Fiddler on the Roof” last played Broadway, the beloved 1964 musical has returned to New York, but in a most unusual way. The National Yiddish Theatre Folksbiene, one of the world’s best-known Yiddish theater companies, is presenting “Fiddler” in Yiddish (accompanied by English and Russian supertitles) at the Museum of Jewish Heritage. The translation is more than appropriate, given that “Fiddler” is based on the Yiddish folk tales of Sholem Aleichem. Serving as director is Broadway icon Joel Grey. The cast mixes Broadway veterans with a few performers who have prior Yiddish theater experience. Considering that “Fiddler” brings to life a Jewish community that was ripped apart due to violent anti-Semitism, the musical enriches the museum and the museum enriches the musical. Read the review. “Fiddler on the Roof in Yiddish” runs at the Museum of Jewish Heritage through Dec. 30. 36 Battery Pl., nytf.org. Snooker, an English billiards game similar to but distinct from pool, brings together a motley crew of small-town eccentrics, shameless hangers-on, criminals and sports enthusiasts in “The Nap,” a well-calibrated, verbally charged, very enjoyable comedy by Richard Bean (“One Man, Two Guvnors”). 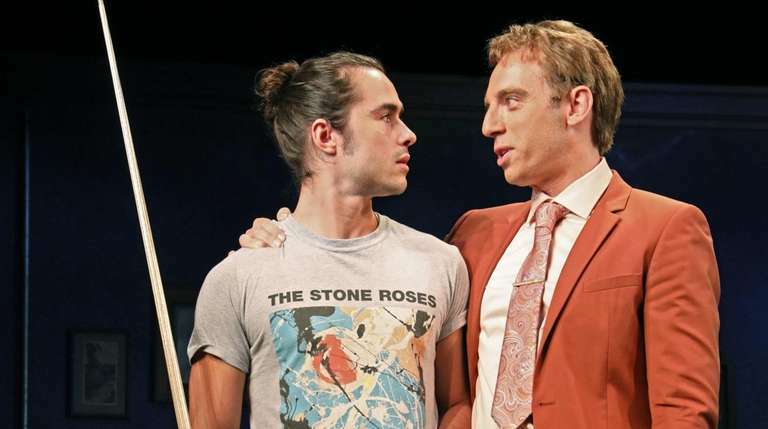 As befits a farce, the craziness escalates in Act Two, utilizing wordplay, surprises, identity reversals and physical action, including snooker matches played live onstage. The production is great fun with thick English accents and foul language. Following the recent death of Neil Simon, it is nice to see that an old-fashioned, silly but smart non-musical comedy can still find a place on Broadway. Read the review. “The Nap” runs through Nov. 11 at the Samuel J. Friedman Theatre. Manhattantheatreclub.com.